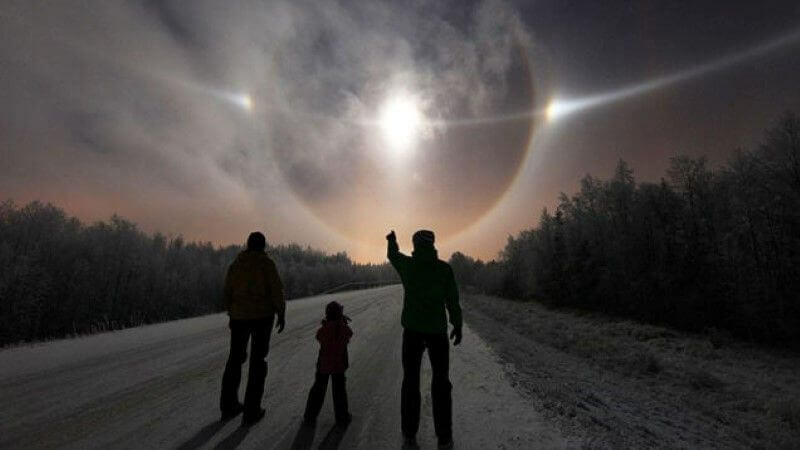 It looks looks like a scene from Close Encounters of the Third Kind, but it’s real—an awesome view of one of the weirdest sky phenomena you can watch from Earth, witnessed at the Levi ski resort, in the Finnish lapland. It was cold and very foggy, the temperature was around -10 degrees Celsius. It was down to the snow-making, as dozens if not hundreds of cannons were making the course for the World Cup and elsewhere. When the clouds began to break, there were rainbow colours in the sky and a halo spanning 360 degrees. These types of events rarely happen together—the sun light needs to refract on millions of suspended hexagonal ice crystals under special meteorological conditions. Only on very rare occasions they all happen under the moon light. In this case, the crystals were produced by the snow machines in the ski station. One more reason to go up north, when these events can happen. The other one being auroras, of course.